Look, we’re all busy. Sure, we like to stay informed, but with so much going on in the world and so little time – how? That’s where AbridgeME comes in. It’s a news and information/reference site that gives you the salient points on news or a topic, and always in 100 words or less. “I founded AbridgeME to create the world’s first crowdsourced reference platform that delivers concise, fact-based explanations of the world around us. The concept was hatched as a way for even the busiest and most distracted individuals to get an understanding of any topic. Knowing that it would be virtually impossible for any one person to be able to explain every important topic in the world alone, the AbridgeME crowdsourced platform was designed to allow any subject matter expert to contribute and help grow the ever-evolving content base,” explained founder Eric Rems, in 100 words or less. AbridgeME is a crowdsourced knowledge platform that delivers unbiased and concise explanations of the world’s most discussed topics (current and historical) for any reader to quickly understand – always in 100 words or less. Contributors from around the world come to AbridgeME to write concise explanations of topics within their areas of expertise for site visitors to easily search and get up to speed quickly on. The company is currently live with AbridgeME.com and will be launching the supplemental AbridgeME iOS app very soon. AbridgeME is the only resource where you are guaranteed to get an explanation of a topic in 100 words or less. In the fast-paced society we live in, it can be difficult to comprehend the details of all the events happening in the world. Sometimes you just want an “elevator pitch” explanation on a topic and the resources out there today are not designed for users to get quick, fact-based overviews on demand. We are also not solely focusing on current events/topics (as most companies in this space are), but we are additionally tackling more historical topics for users to get a quick, expert-delivered explanation – for many years to come, there will always be someone looking to get up to speed quickly and gain an understanding of the events that have shaped our society (World War II, September 11th, etc.). By coming to AbridgeME first, and taking in the facts on a given topic prior to jumping into the news, the more informed reader can then engage intelligently and form his or her own opinion on the subject at hand. To help facilitate this, we have tapped into the Yahoo News API to provide links to the news around each current topic for users to then dive in and learn more, if interested. The market we are attacking falls under what we consider the online reference information space (i.e. Wikipedia). The top 5 reference websites command roughly 1 trillion visits per month – the market is huge and global. Dollar value wise, that translates to several billion dollars in ad revenue alone. We see the online reference information space as dominated by a few large players who have built deep content bases over the last 10+ years. By creating a new medium to explain any topic in 100 words or less, AbridgeME is able to deliver to the world purely concise explanations to anyone with an Internet connection. AbridgeME is free to all users. Eventually we plan on charging for premium API access so media outlets can tap deeply into our expert delivered content. We are also in talks with existing content providers to promote ‘sponsored’ news stories that will be included next to the expert explanations on a given topic. As we further build out our “Badge” earning functionality for contributing writers, we will look to partner with advertisers to sponsor badges and deliver giveaways when certain levels are achieved. From a technical perspective, we are focused on rolling out the supplemental AbridgeME iOS app (very soon! ), fine tuning the existing AbridgeME.com platform, and developing a useful API for other sites/apps to leverage our content. From a user acquisition and content creation standpoint, our biggest push right now is attracting experts to our platform to contribute their knowledge (anyone know Neil Degrasse Tyson personally?). On that same note, we’d like to grow our existing content base 3X. This all aligns with increasing our branding awareness as the go-to resource for a quick, well-written summary on any topic. We plan on achieving these goals while actively looking for that ideal investor. An ideal investor for AbridgeME would be someone with deep experience in the online media industry who is looking to play an active role in building the AbridgeME brand and leveraging their contacts to form strategic partnerships. That said, if I had to pick one person in the NY community, it would be Eric Hippeau from Lerer Hippeau Ventures – as a former media executive with experience in the consumer web, he would be the perfect person to learn from and to open the right doors to help form strategic partnerships. 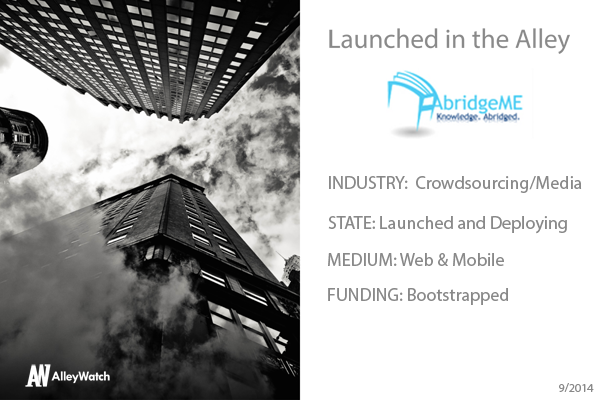 Besides the fact that I live and love NY on a personal level, the tech startup scene here, and especially the people in the ecosystem, make it a great place to launch a bootstrapped, disruptive, company like AbridgeME. Our user base is also very global, so it makes perfect sense to be at the center of it all here in NY. What’s the most popular subject or article that people search? ISIS Militants is an incredibly popular topic right now as they are a complex and dangerous group that is constantly in the news. People just want a quick “elevator pitch” explanation of what they are trying to achieve so they can better understand the news that is continuously coming out on them. What’s your favorite NYC leisure activity, in 25 words or less? Grabbing pre-made food, some park games, a little booze, then heading to Sheep’s Meadow in Central Park for the day with friends.